Monday Classes (10-11:30am) are on-rotation with Axis Syllabus teachers and others. Please check our Facebook Page for updates. AYELET YEKUTIEL (certified teacher from Israel) is leading all Mondays in March! Ayelet teaches Axis Syllabus, contemporary dance, and Body Mind Centering. SEBASTIAN GRUBB is leading classes in February, focusing on Ramping Techniques. More info here. $12 per class with a package: 2+ classes purchased together, to be used within 1 calendar month. 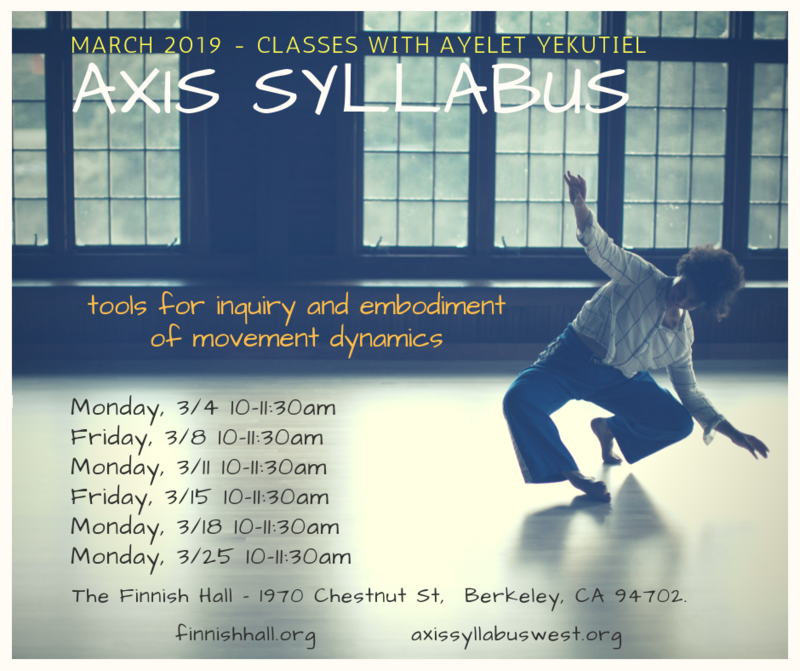 An Axis Syllabus inspired dance class Led by Nuria Bowart, a teacher of the Axis Syllabus, Capoeira, and generally fun and useful movement patterns. In this class we will practice going in and out of the floor. Learning about the biomechanics of the body, and then moving our stories. Within its very design the body will suggest effective and efficient pathways for motion. The Axis Syllabus can be useful in helping the cultivation of awareness about the body that is functional. This class is for all levels of mover. Nuria also works as a performer and Rolfer. Axis Syllabus Teacher Candidate Sam Stone facilitates a working space for unfolding fundamental ideas found in the Axis Syllabus. Join in for experimentation, improvisation, peer exchange, application and flow. All varieties of experience welcome. AYELET YEKUTIEL (certified teacher from Israel) is leading March 8 and 15! More info here. Classes aim to empower individuals by deepening anatomical knowledge, structural integrity, kinetic conservation, and proprioceptive activation. By attuning through exploration of form and function we expand our capacity for creative articulation as movers. Facilitated embodied inquiry and choreography will be grounded in principles of the intelligent design of our bodies, fostering dynamic possibilities and delight in your dancing. Movement training is life training. Sarah is a Certified Axis Syllabus Teacher, interdisciplinary artist, and bodywork professional. She currently teaches A.S. classes through contemporary dance and embodiment training.